The Wild Bird Fund told me to call this week about my bird except they’re not returning my calls. I expect it’s bad news, but I wish they would just tell me. 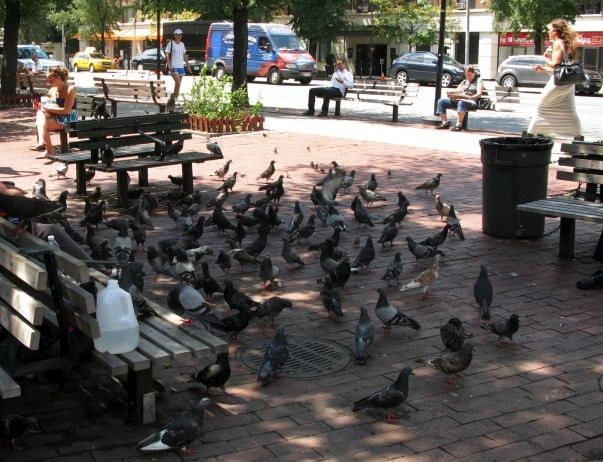 Someone was feeding the birds in this park at Bleecker and 7th Avenue. Her caretaker came at me saying “No senora” and other things I couldn’t understand. I gathered she didn’t want me taking a picture of the woman feeding the birds, so I edited her out. But for the record, in the picture it looks like the woman was smiling at me. Maybe she recognized a fellow bird lover.